POW! and THE QUEST FOR EL DORADO: The Doctor’s Regeneration?? Reiner Knizia was at the spearhead of the First Wave of German boardgame designers who revived tabletop play in the 1990’s. He’s designed so many classics it took me two articles to cover his career back in 2015 (here and here). His games are known for their complex VP calculations (he has a Doctorate in Mathematics), and their often tenuous connections to their themes (there are exceptions, such as his co-operative Lord of the Rings). For the last decade, though, he seems to have scaled back his efforts, releasing mainly kids games, apps, and various knockoffs of earlier designs. 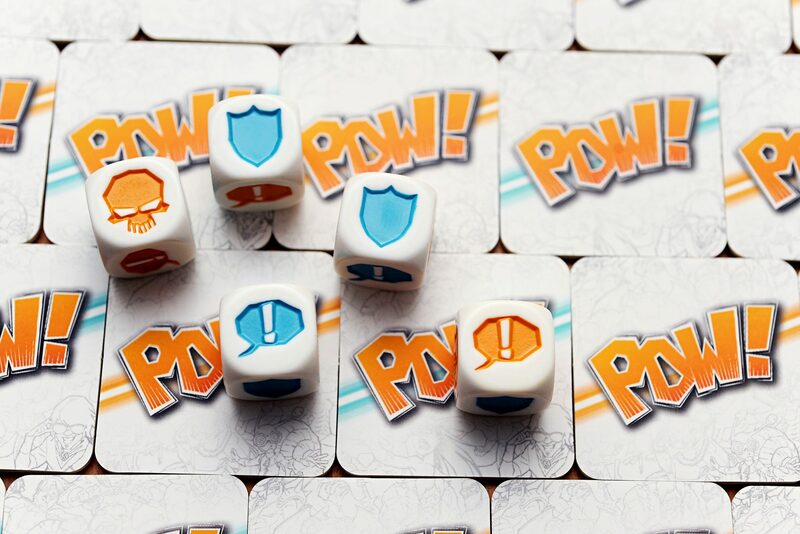 Last year’s POW!, by Gigamic, is a typical example. It’s a reskinning of 2008’s Sushizock im Gockelwock, which in turn borrowed several ideas from 2005’s Pickomino and 2006’s Risk Express. Repurpose, reuse, recycle. POW! now pretends to be about comics–specifically, players are comic book writers competing to compose the best “graphic novel” by drafting heroes and villains. And as any fan of the Dark Knight knows, you need both to make a great story. 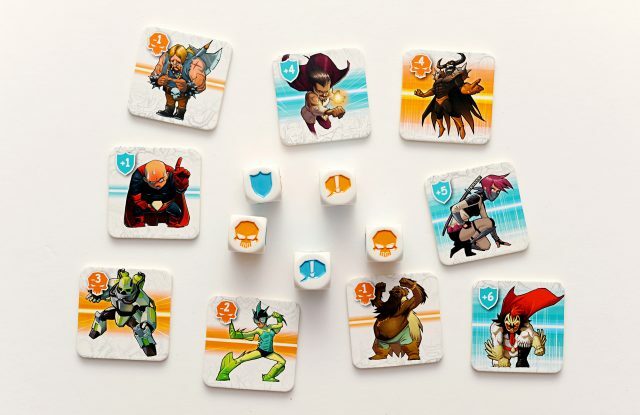 Each of the five d6 in the game has two shields (for drafting heroes), two skulls (ditto villains), one “steal-a-hero” speech bubble and one “steal a villain” speech bubble. Players roll the dice three times to fine-tune their results, but as in many Knizia dice-rollers, you must “lock” one more die each time you re-roll. Depending on the final result, you may get to take a hero or villain from the center OR steal one from an opponent. The game is over when all the dudes have been drafted. POW! does have a couple of neat twists. When you draft from the center you must take the dude that is exactly that many shields/skulls from the right. And since the dudes vary in point value, more shields or skulls is not necessarily better. The end-game scoring makes for interesting decisions, too: all your villains’ (negative) scores count, but if you have more heroes than villains you shave the excess heroes off before tallying your score–which doubly incentivizes grabbing “big” heroes early on. The artwork, by Jonathan Aucomte, takes just the right tone, and it’s a subtle but pleasant surprise to see a diverse array of humans, not to mention the robots and insectoids. The publishers wisely refrained from naming any of their dudes on the tiles, so that you and your buddies can have fun coming up with your own monikers. All in all, POW! is a quick and light filler game with high-quality components that doesn’t outstay its welcome and comes in a small box. Good value for your money. But…c’mon, admit it, we expect more from The Doctor, don’t we? When I saw that The Quest for El Dorado was nominated for a 2017 Spiel Des Jahres I was skeptical. Was this nomination truly for the game itself, or sort of a career-award? And really, like he needs it? He’s already won the SdJ award twice, and literally twenty five other GotY awards. And then there’s the game itself. Deckbuilding?! No complicated math?! A race game with no VP?! A theme that actually integrates with gameplay?! Somebody slap me. Indeed, all the above are true. Players are hacking their way through jungles, crossing treacherous rivers, sneaking through towns, and generally getting in each other’s’ way trying to be the first to reach the fabled city of gold. The map is modular, with many two-sided tiles providing literally hundreds of thousands of possible configurations (the rules include a few pre-built scenarios plus suggestions for how to design your own). The grid is split into hexagons, each with its own terrain and “power value”. Most require you to play a card of the same type with a power at least as high as the hex you want to enter. Some force you to discard card or cards from your hand, and still others require you to delete cards from your deck entirely (which is useful later in the game anyway). 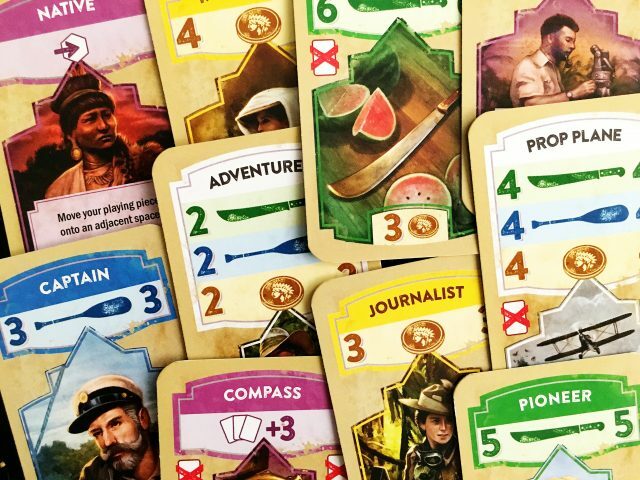 Yes, Knizia has finally designed a deckbuilding game–you can’t exactly accuse him of jumping on the bandwagon. To his credit, he’s has made enough tweaks in the formula to provide for some very interesting decision-making. First, there are only three cards per available pile–so you better get to market quick. Second, although there are usually only six choices available to buy in the market, when a pile runs out YOU get to choose which pile gets slotted in from the waiting list. Hmmm…do I want to make Compasses available to everyone else, too? And as usual, Knizia figures out how to do a lot with just a few little rules. For instance, players can not move through each other’s pieces–which means if you get to a chokepoint on the map first, you force people to either take the long way around (usually takes a while) or wait while you sit there, using your turns to buy up good cards from the Market. Secondly, unlike any other deckbuilder I’ve played, you can split the value of high-powered card to move several hexes, but you can’t combine values of low-powered cards to enter a single high-powered hex. This forces players to plan ahead (ie look at the later parts of the route) to see what kind of cards they will need to buy. All this means that the game is hugely replayable despite having far less variety of cards than the usual deckbuilder. 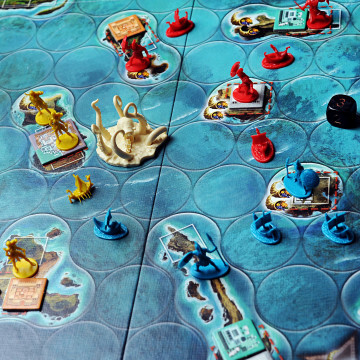 You just don’t need them–it’s the particular map you’re playing on which helps determine your strategy. Plus, the game comes with a Caves expansion which adds even more variability to setup, so really don’t think the smaller cardset really counts against it. 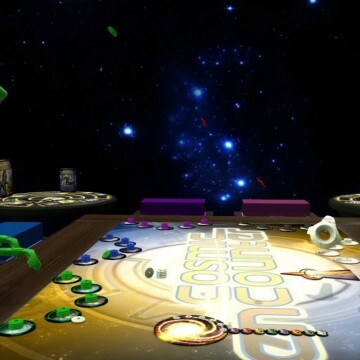 The game can even be enjoyed by two players with a simple rules modification, very Kniziesque, whereby the winner has to be the first to get two adventurers across the map–and because you also block your own guys as well as the other player’s, it makes the game challenging and playable. I’m thinking of designing a simple solo variant; I’ll keep y’all posted. 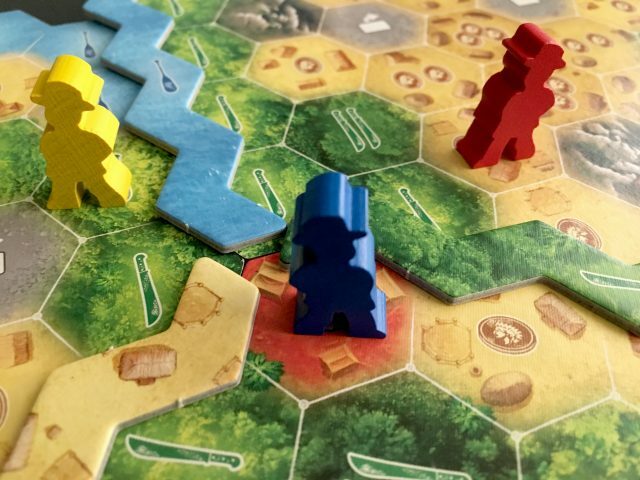 Quest for El Dorado may not be as heavy as some of Knizia’s classics–but it is definitely a very good game, and is a solid addition to any collection. Forget Gallifrey–El Dorado is where The Doctor re-emerges as a first-rank designer. 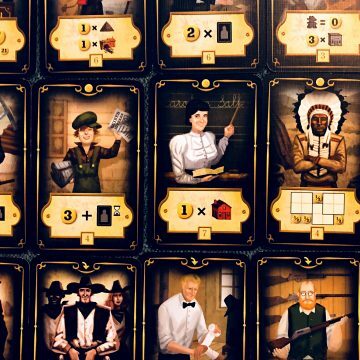 CARSON CITY: The Card Game, or Cardaptations, What Are They And Why Should I Care?